Glaucoma is often referred to as the “sneak thief of sight.” That’s because it is known to cause irreversible damage to vision with no symptoms. Once vision loss occurs, it is impossible to restore. Our glaucoma specialist provides premier eye care to our clients throughout the Wilkes-Barre and Scranton areas. Early detection is important for your future treatments of glaucoma, having a yearly eye exam plays a huge role in maintaining your healthy vision. Glaucoma occurs when the pressure inside of the eye (intraocular pressure) becomes elevated for a long period of time. As the pressure builds, the eye swells and presses up against the optic nerve, causing damage. The damage to the optic nerve and subsequent vision loss are both irreversible. The longer intraocular pressure is elevated; the more damage it will cause. There are no symptoms of elevated intraocular pressure. Glaucoma is usually diagnosed during a routine eye examination. The most common method of diagnosis is the use of tonometry. During this test, your eye is numbed and an instrument called a tonometer is pressed gently against the eye. This device will then measure the pressure inside of your eye. Other diagnosis methods include inspection of the eye’s drainage angle, inspection of the optic nerve, and testing of your peripheral vision. Glaucoma can be treated in multiple ways, depending on the patient. Eye drops designed to lower intraocular pressure are usually the first step. If those do not lower intraocular pressure enough, our doctors may suggest laser surgery or microsurgery. It is important to remember that these treatments do not cure glaucoma. They stop glaucoma from damaging vision further. There are many risk factors that make someone more prone to developing glaucoma. Keep in mind, however, that glaucoma can occur in anyone, regardless of risk factors. Have diabetes, frequent migraines, high blood pressure, or overall poor health. If you have not attended your routine eye exam in a while, be sure to give us a call to set up your appointment. Prevention is the best cure! If you have been diagnosed with glaucoma, contact Eye Care Specialists to begin your glaucoma treatment as soon as possible. 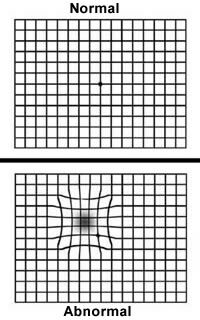 The Amsler grid is a tool that our eye doctors use to detect vision problems. It is helpful in detecting problems with the macula (the central part of the retina) or the optic nerve. An early diagnosis often means early treatment. Wear eyeglasses you normally wear for reading. Test each eye separately: Cover one eye with your hand while testing the other eye. IMPORTANT — Report any irregularities to your eye doctor immediately. You can even mark areas of the Amsler grid that you’re not seeing properly (print two grids if you notice problems in each eye), and bring the grid(s) with you when you visit your eye doctor at Eye Care Specialists.